Simple to assemble and easy to adjust heavy duty Dexion Longspan Archive Shelving. 2000mm high x 2012mm wide x 600mm deep complete bays with 4 chipboard shelf levels and 35 archive storage boxes. 4 x pairs of adjustable height beams, to give 3 shelf levels. Extension bays can be added to create additional bays, supplied with 1 x pre-assembled end frame, 4 pairs of beams, safety locks, 4 chipboard shelf panels, and 35 archive storage boxes. Quick and simple to assemble, Longspan shelving is modularly designed to supply maximum storage capacity in any available space, making it perfect for archive storage. 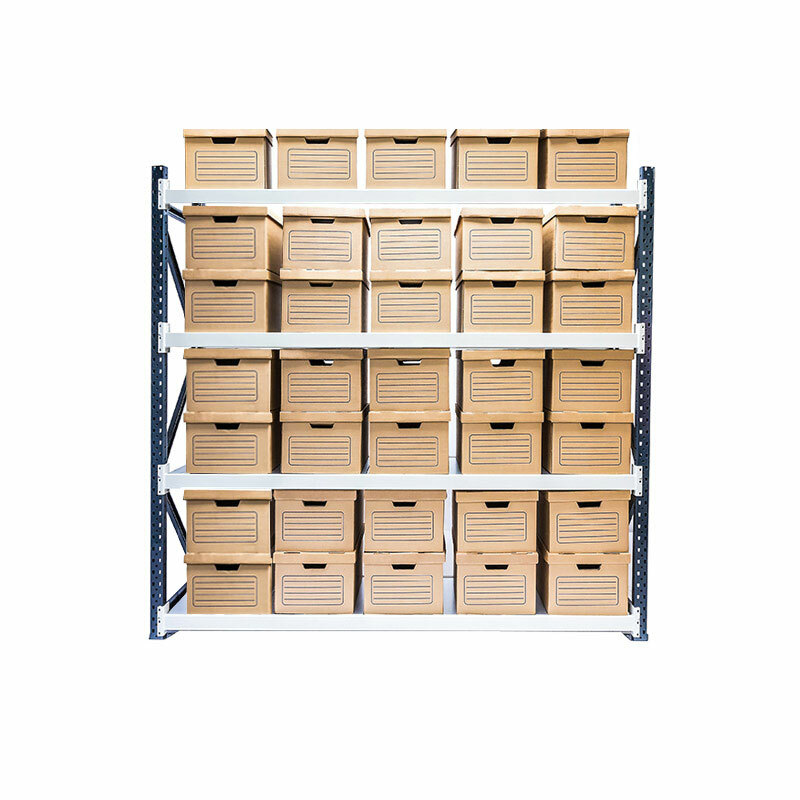 Medium and long span bays can be combined in the same rack for the efficient storage of a wide variety of items. A safe, easy to use and adaptable system that will provide maximum storage capacity whatever you need it for, longspan shelving is strong, highly durable and is perfect for providing an archive storage solution that can adapt to fulfill all your requirements. Above configurations available from stock on rapid delivery. Longspan shelving can also be supplied or installed in heights of up to 5000mm, widths up to 3000mm and depths up to 1200mm. Find out more about the capabilities of Longspan shelving here.